We can’t believe that we are into our final week in Year 1, the year seems to have flown by! Please could children bring a named carrier bag into school on Monday so that they can bring their Year 1 books home. Children will not be bringing home the literacy book which they are currently working in because this will be passed up to Year 2 for the children to continue working in as part of their transition. These books will be sent home by the Year 2 teachers. A reminder that school finishes at 1pm on Thursday 19th July. Children will not be eating lunch at school but may bring a second snack as well as their fruit to keep them going. Please note that there will be no bus on this day. Thank you for all your help and support this year, we have appreciated it and hope you have a lovely summer holiday. We look forward to following the children’s progress as they move into Year 2 in September. A huge thank you to everyone who turned up yesterday to help out on our Gardening Day. A fantastic job of clearing and weeding has been done and the garden is looking so much better. The children really enjoyed helping out and doing the bug and scavenger hunt. I appreciate that it is short notice, but is anyone available to help with swimming tomorrow morning please? Ideally to go in the water, but otherwise pool side to help with changing would also be very helpful. This will be our last swimming lesson of the year. On Monday morning the children will spend another session with their new class and Year 2 teacher. The children are looking forward to welcoming you on Tuesday. Please come suitably dressed as there is lots of weeding, clearing and planting to do. The children can still wear their uniform as usual. We also have some other outdoor activities which you can do with the children. On Monday morning children will visit their new teachers again for a short story session. We hope they enjoy these opportunities to get to know their new teacher and classmates. There will then be one more longer session on Monday 9th July. Any work you can do on this at home will be very helpful. The children are really enjoying our work on Captain Cook. We have found out about his discoveries of New Zealand and Australia, made Ta Moko masks and some aboriginal art work and researched Australian animals. Next week we shall be finding out where he went next! Just a reminder about our gardening day on Tuesday 10th July. Thankyou to all of you who have already returned a slip. We look forward to seeing you all. If you have any gardening gloves or secateurs at home then it would be helpful to bring these in to use as we only have children’s sized equipment in school. We also suggest wearing clothes suitable for gardening. There is lots of weeding and de-heading, cutting back and planting to do. The children will also enjoy showing you what we are growing and how they use the resources in the garden. Thankyou for your support with the sponsored swim. Please could all outstanding sponsorship money be returned as soon as possible. Please could we remind you that all children need to have a hat in school. If you apply suncream in the morning but would like your child to reapply this themselves at lunchtime (particularly after swimming) then please feel free to send in a named bottle for their own use. Please note that we cannot apply cream to children. PE and Games lessons will continue on Wednesdays until the end of term. Please can all children bring in their kit on this day. We have another busy week coming up. Well done to Mrs Boscher’s class who have already done their sponsored swim. Mrs Bramley’s Class will be doing theirs on Tuesday 26th June from 9-10.30 and Miss Horsepool’s Class will be doing theirs on Thursday 28th June from 9-10.30. Please remember to return sponsorship forms and any money that you have already collected. On Friday 29th June the children will have their first transition session where they will meet their Year 2 teacher and spend part of the morning in their new class (due to this session, Mrs Boscher’s Class will not be swimming next week.). Children will bring a letter home at the end of the day informing you who their teacher will be. In our Literacy and topic work we will be continuing to learn about the adventures of Captain Cook as he explores New Zealand and Australia. In maths we will be doing some more work on halves and quarters. We will be holding a gardening day on Tuesday 10th July. Click here for the letter. (you should have already received a hard copy of this). Due to a scheduled transition day for Year 1 on Friday 29th June, we unfortunately have to move our sponsored swim day to this Friday 22nd June. The swim will take place starting at 9am until 10.20am and hope that you can still come and support. We apologise for the short notice. In our Literacy and topic work we will be continuing our work on Captain Cook. In maths we will be doing some work on money and finding change by finding the difference. Our sports day will take place on Monday 18th June. The children will be taking part in a variety of fun activities which start at 1.15 pm with the final races at approximately 2.15 pm. You are very welcome to come along and support your child. We have several children in the year group who have nut allergies. For this reason, please could we remind you that children should not have anything in their lunch boxes which contains nuts, for example peanut butter sandwiches, anything with Nutella (contains hazelnuts) in etc. Please could we remind you that all children should have a sunhat in school every day and have suncream applied before they come to school. 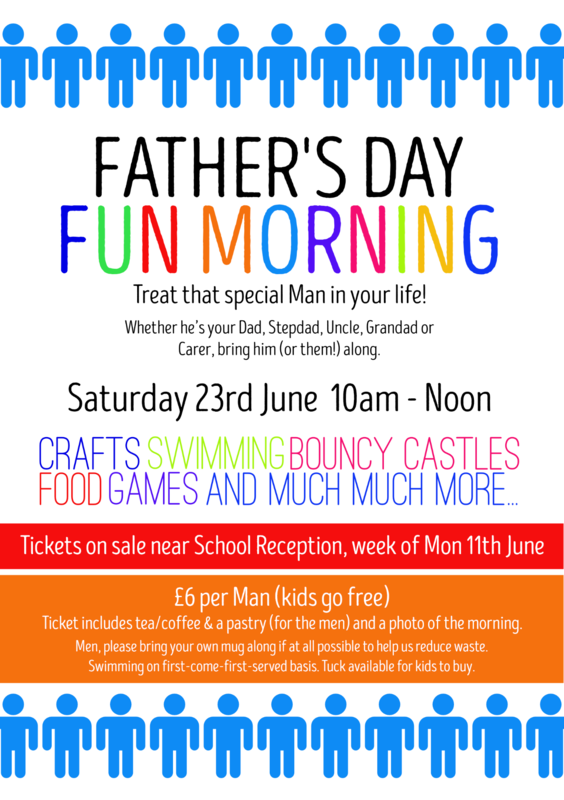 Don’t forget to come and get your tickets for the Father’s Day Fun Morning. Tickets are being sold all this week outside Main Reception from 8.30am to 9am and 2.30pm to 3pm. 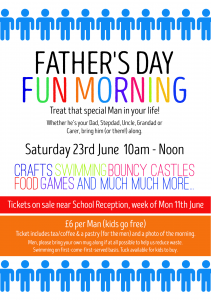 The tickets are for the children and the Special Men in their lives; whether it’s their Dad, Stepdad, Uncle, Grandad or Carer and they make a great Father’s Day Gift! Whilst this event is for the Men; Ladies you are very welcome to come along and help. Just speak to the folks selling the tickets and sign-up then!